M3 is displayed on a turntable road at Don, as seen (behind and somewhat obscured by H7) in this photo of 8 May 2003. 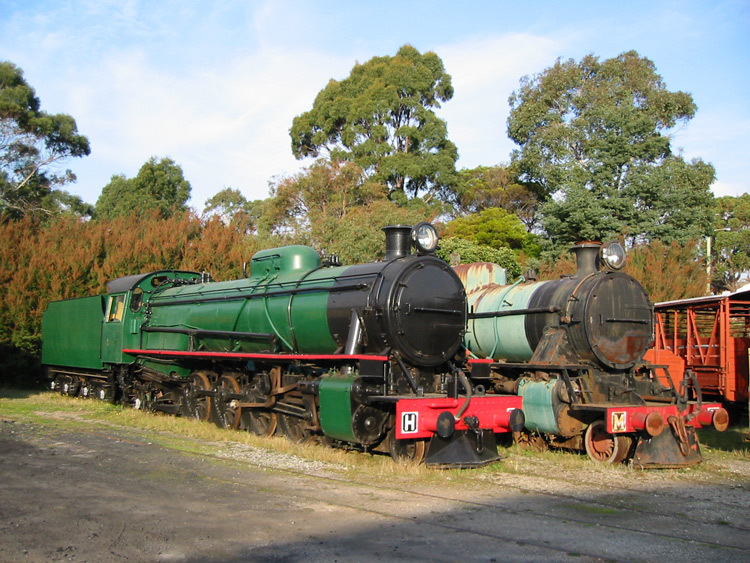 Both the Tasmanian Government Railways M & H-class locomotives were of modern design, featuring roller bearings on all axles and throughout the motion and the only Australian classes to be completely fitted-out with roller bearings. They were also fitted with Australian designed SCOA-P wheels which provided greater strength and lower weight; other Australian locomotives fitted with this design of wheel were the Victorian Railways' R & J classes and the Queensland Railway's BB18-1/4 class. M3 is statically displayed at the Don River Railway at Don in Tasmania's north, being one of four M / MA class locos preserved at this excellent museum and workshop. a L. Oberg, 'Locomotives of Australia', published by J. W. Books Pty Ltd, Brookvale NSW. 1982 reprint. b Dix, A., Beck, D., and Dix M. 'Locomotives of the Tasmanian Transport Museum Glenorchy Tasmania', published by the Tasmanian Transport Museum Society, October 1991.